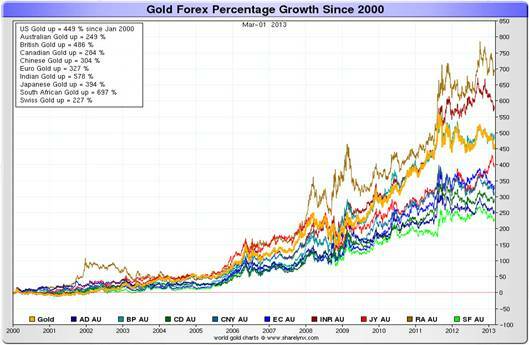 In reflecting on this two-year smash of precious metals, and in particular, mining shares, let's take a look at some currency history of the last decade to provide us with some much needed mental capital. 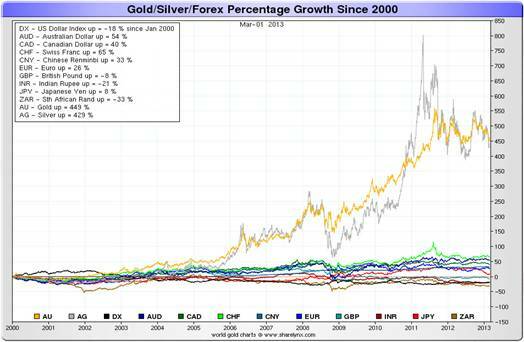 Despite recent setbacks, gold and silver have been the strongest currencies on the planet for the last 13 years. What's important to note is that global supply of gold and silver remains somewhat constant---increasing at a rate of about 1% per year (and falling), while global supply of fiat paper currencies can be expanded by any percentage size, at anytime. 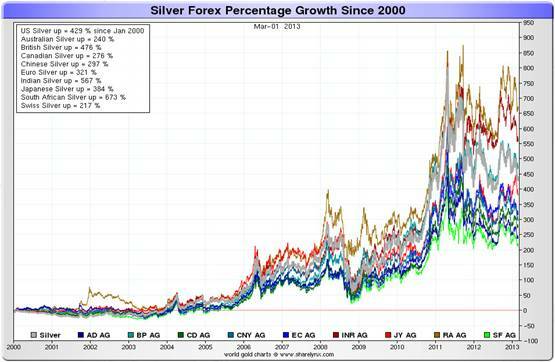 Therefore, we must conclude that either pre-existing supplies of global currency units having been rushing into precious metals over the last 13 years, or the total global money supply of all currencies is expanding at a frightening rate---with gold and silver signaling the expansion. It appears based on this chart (as well as the next) that South African & Indian Reserve Banks are far outperforming Bernanke's Fed, in terms of increasing money supply---and devaluing their currencies against precious metals. Or rather, those two currencies are "voicing" their money supply growths (through the instruments of gold and silver) more promptly than the others. Bottom Line: Gold & silver have remained the same over the last thirteen years while world currencies have expanded in supply by staggering sums. Will currency supply expansion continue? Will quantitative easing programs expand to preserve global financial orders? If the answer is yes to these questions, then ignore the short-term noise of the market and hold your long-term positions in the world's oldest, strongest forms of money.